MP4 format is a very popular video format today in the online world because it can store audio and video both types of data in a single file. This format is used to store the high quality video with the high quality audio. People handle lot of information in this format such as interviews, movies etc. Sometimes we have files in the 3GP format which is not a high quality format and reduce the original quality of videos. In that condition if you like to convert 3GP to MP4 format to play on multiple devices then we will learn how to do that with a 3GP to MP4 video converter software or online website in this article. 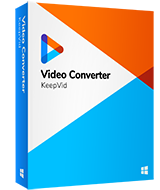 KeepVid Video Converter is an all-in-one 3GP to MP4 video converter program which convert your videos in desired format in high quality. 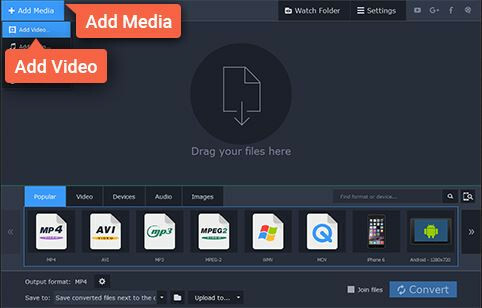 This converter program enables you to convert your videos in any format and you can also customize the formats before starting conversion. 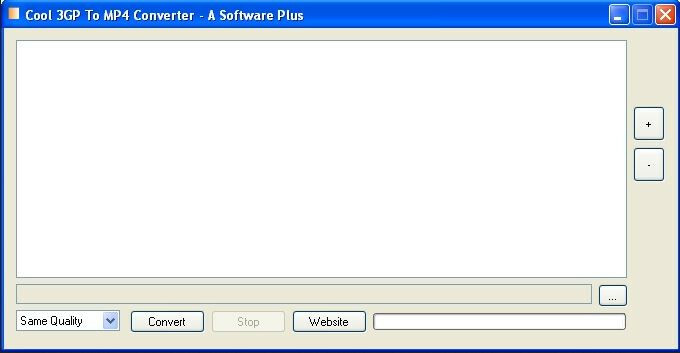 This converter program comes with a very handy and easy to use interface which can be used by any person even if they don’t have any technical knowledge. Supports up to 1000 audio video formats to convert files. It gives you unbelievable 30x faster speed while video conversion. Supports downloading videos as well so you can grab online videos from 10000+ sites. Step 2. Select MP3 as an output, and click the Convert button to start converting 3GP to MP4. Choose the appropriate version of the program according to your operating system and install it. After installing launch the software, press “Add Files” option in the top left of convert tab and choose the files from your system. In the top right of convert tab click the downside icon and choose the MP4 as the output format from the list of video format in the “Video” tab. After setting output format as MP4 click the “Convert All” or “Convert” button in the convert tab. KeepVid Video Converter will convert your videos by 30x faster speed now. 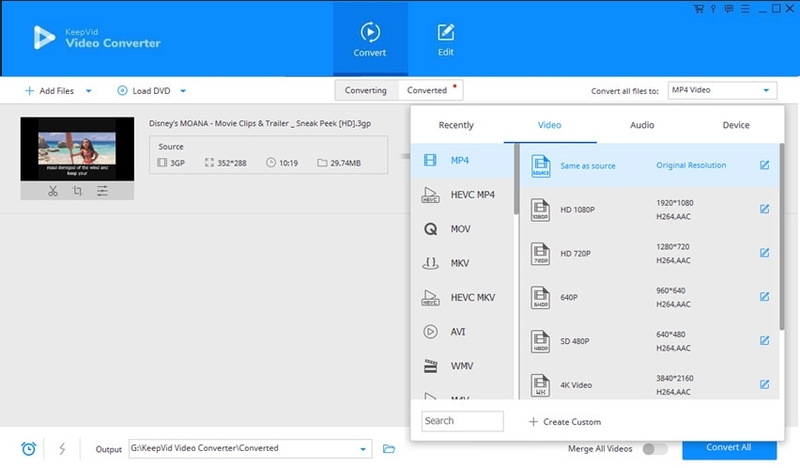 • There are many preset profiles available in the KeepVid Video Converter for MP4 format so always choose high quality MP4 output to get the video in original quality. • You can always edit the video resolution before conversion to get the best results in your desired output quality. • If you are unable to find the desired format then you can use the search button to find the appropriate formats. • There're also several helpful online and desktop converters that can help you to convert MP4 to 3GP, check it out. KeepVid Online Video Converter is another solution provided by KeepVid to convert the video files. This solution allows you to convert the videos in other formats without any software or app installation. You can simply upload the files from your system and choose your desired output format to convert files. After choosing file format click the “Convert” and this website will convert your files automatically. You can convert the videos in 60 audio video formats on this website. Online Convert is another online converter website where you can convert video, audio, documents, EBooks, Hash and images in multiple formats. This converter website also supports conversion of online videos and gives you a download link after conversion but for copyright issue YouTube is not supported. Quality of the converted videos will be fine and you can do all these conversions for free without any charge or installation. Movavi Video Converter is a very lightweight video converter program available for windows or Mac OS devices. With this converter program you can convert 3GP to MP4 in few clicks only. This 3GP to MP4 video converter also supports many other input and output file formats to convert the multimedia files. Convert videos from one format to other formats quickly. Supports DVD and many other types of formats as well. Cool 3GP to MP4 converter is a very easy to use and lightweight converter program for Mac and windows operating system. This program is specially developed to convert 3GP videos to other formats so it can easily convert the any type of 3GP file. Another good part of this program is that it is a free software without any charge. Easy to use interface and lightweight program. Allows you to set bitrate, frame size, crop and adjust frame rate. Supports batch video conversion to convert multiple files at once.